A Heart Container from Skyward Sword. The Heart Container (ハートのうつわ, Heart Container), known simply as Heart in Smash 64, is an item that will reduce the damage of the character who picks it up. Its operation has remained functionally identical, but the nuances of its healing have changed in some of the games. A Heart Container (to the right of Link), as it originally appeared in The Legend of Zelda. The Heart Container made its first appearance in The Legend of Zelda. At the beginning of The Legend of Zelda, Link starts off with a maximum health capacity of three hearts. When Link finds a Heart Container, it gives him another heart of capacity, allowing him to sustain more damage before dying. Starting in The Legend of Zelda: Link's Awakening Heart Containers would also replenish Link's health to full upon collection. In Super Smash Bros. and Melee, the Heart Container's design is based around Ocarina of Time's Heart Containers. Its appearance changed in Brawl to the design in The Legend of Zelda: Twilight Princess, like most Zelda content. The design of the Heart Container changed once again in Super Smash Bros. 4 to match its appearance in The Legend of Zelda: Skyward Sword, giving it a slightly thicker and more detailed aesthetic. The Heart Container retains its Skyward Sword design, also used in The Legend of Zelda: Breath of the Wild, in Ultimate. Heart Container in Smash 64. Heart Containers take on their appearance from Legend of Zelda: Ocarina of Time. They spawn above the ground and float down slowly, creating a delay before they land. While this has little effect in later games where item can be grabbed in the air, it means that in the original Super Smash Bros. players must fight for the area where it will land as it falls. 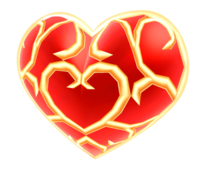 Once grabbed, the Heart Container heals the user, recovering damage all the way down to 0% (even if the player is hit during this time). In Super Smash Bros. consuming at least two or three Heart Containers in a match (respectively) gives the player the Heartthrob bonus, worth 17,000 points in SSB and 2,800 points in Melee. As the Heart Container is the only healing item in Melee that is not also a "food" item, consuming three Heart Containers is the only way to attain the Wimp bonus, worth 1,500 points; as a result, the Wimp bonus always overlaps with Heartthrob. Heart Container in Melee on Final Destination. Heart Containers again take on their appearance from Legend of Zelda: Ocarina of Time. Heart Containers function the same as in 64. However, it only heals a total of 100%. The player is given three Heart Containers in the All-Star Rest Area that can heal all of their damage instead of the standard 100%. Due to a glitch, entering the teleporter in Melee will interrupt the Heart Container's healing and thus not fully heal the player. Completing All-Star Mode in Melee without using a Heart Container or Continuing gives the player the Melee Master bonus, worth 100,000 points. The Heart Container appears as a collectable trophy. Heart Containers drift toward the ground slowly and replenish 100 percentage points of health. In The Legend of Zelda, these items beefed up Link's life meter; in most cases, Link found them in the possession of bosses or hidden in secret areas. Heart Containers are often scattered across the land in several fragments. Heart Container in Brawl on Final Destination. Heart Containers take on their appearance from Legend of Zelda: Twilight Princess, and they function the same as in Melee. In the two-player cooperative versions of All-Star Mode and Boss Battles mode the game instead gives players five Heart Containers. Heart containers will now fully heal the user in both modes even should they enter the teleporter while healing. The best recovery item! Grab this and heal 100 percentage points of damage. It falls slowly, so it's best to grab it in midair. Damage recovery won't happen instantly, though, so try not to get launched while your damage is counting down. In the Legend of Zelda series, Heart Containers raise the player's maximum health. Bosses always have one in their possession. 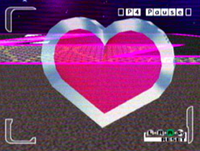 A sticker depicting a Piece of a Heart Container can be attained in Brawl. Usable only by Link, Zelda, Ganondorf and Toon Link, the sticker causes Heart Containers to heal 150% damage instead of only 100% damage. Meta Knight and Kirby standing next to a Heart Container in for Wii U. Heart Containers take on their appearance from Legend of Zelda: Skyward Sword, and they function the same as in Brawl. Heart Containers are not affected by equipment that increases damage healed in SSB4, as they are not "food". This classification goes to the Fairy Bottle too. Smash 4's All-Star Mode, the player receives only one Heart Container initially and gets two if playing after unlocking all characters, but they also receive a Maxim Tomato and Fairy Bottle. In Super Smash Bros. for Wii U, a Heart Container will drop on the stage when Master Fortress appears, which fully heals the player like in All-Star Mode. It can be left alone and used in later phases, if the player returns to the stage proper. The Heart Container appears as a trophy in both versions. An important item in the Legend of Zelda series, this item would appear when you beat a boss and increase your life by one when collected. In Smash Bros., grabbing this will heal 100 points of damage. Grab it as it gently floats to the ground! A quintessential item from the Legend of Zelda series that raises your max health. In those games, you have to defeat bosses to get them, but in this one, they'll just fall from the sky, which makes things a whole lot easier. If you see one, grab it quick - in mid-air if you can! Why? To take 100 off your damage - that's why! Link pretending to hold up a Heart Container in Ultimate. Heart Containers again take on their appearance from Legend of Zelda: Skyward Sword, and they function the same as in Smash 4. A render of a Heart Container from Ocarina of Time and Majora's Mask, used for Smash 64 and Melee. A render of a Heart Container from Twilight Princess, used for Brawl. Heart Container artwork from Brawl. A render of a Heart Container from Skyward Sword, used for Smash 4 and Ultimate. Four Toon Links surround a Heart Container in Ultimate. This page was last edited on January 5, 2019, at 16:09.